Guys. I have no words for how delicious this is, you are going to love it. Like really love it. I shared it over the weekend on my Instagram stories and I really wish IG stories came with a smell feature. Can somebody in Silicon Valley please get on that? 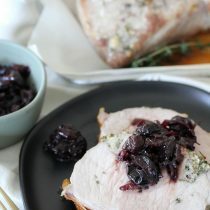 So many of you have already messaged me asking for the recipe, I love it! 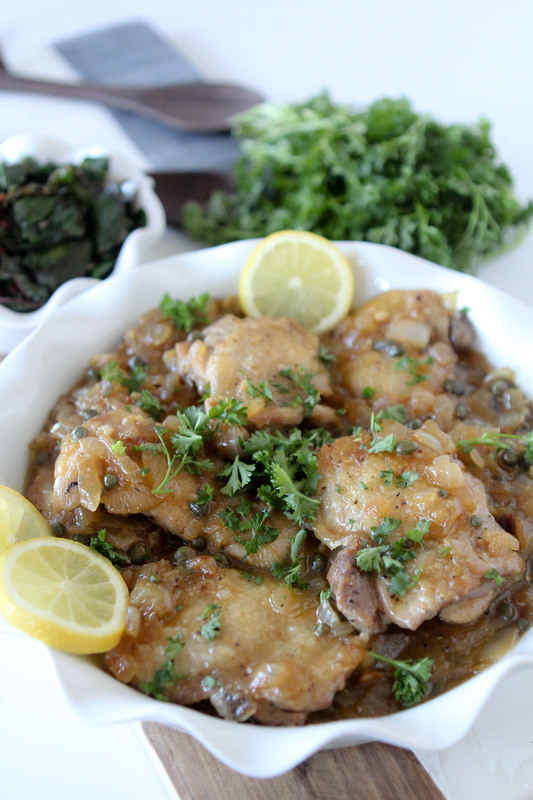 I’ve always loved Chicken Picatta and was excited to create my own and give it a little twist. Nothing drastic, don’t worry, your favorite flavors are all still there. We’ve got lemon, onions, capers, we’ve got the chicken… it’s all there. But I did make a couple of changes. First I swapped out the chicken breasts for the more flavorful chicken part… the thighs. Skin on, bone out. I’ve always been more of a leg/booty girl myself anyways. I also used a tiny bit of gluten-free flour to thicken it up a tad. If you’re Whole30-ing you can leave this step out and still have a delicious dish. What I really wanted to do was add some greens to it so that we could have a complete meal in one pan. 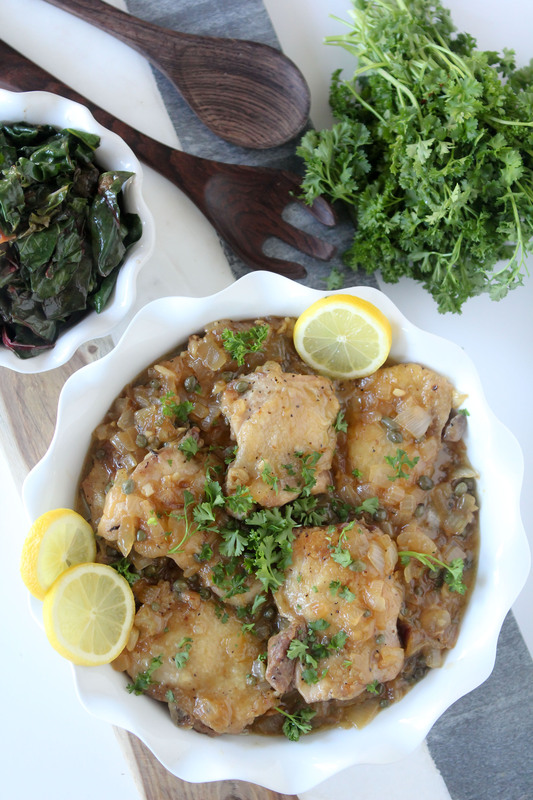 I know that after making a pan of chicken picatta there’s a lot of amazing goodness stuck in that pan, so I figured why not take all of that flavor and add it into something else? I mean, why should the pan get all that love? Unless you’re one of those people that picks up the crusties and goodies stuck to the edges of pans. I, most definitely am. Actually, is there anybody that doesn’t like that? I mean everyone picks the brownie pan clean, right? Maybe not spoon out the chicken bits and schmaltz from a pan (like me) but brownies and cheese are always picked clean, right? I guess it’s bittersweet cooking the rainbow card in all that goodness. But trust me, it’s so worth it! Ok, back to the recipe. 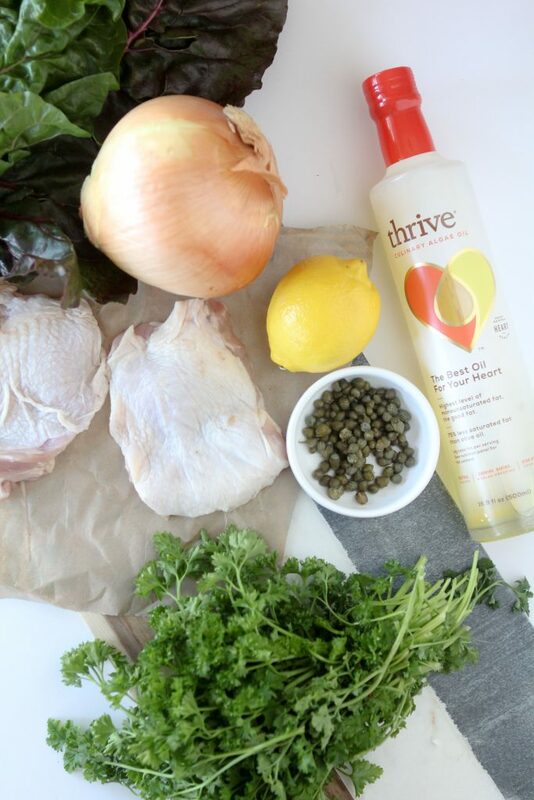 One of the things I’m most excited about in this recipe is Thrive Culinary Algae Oil. If you saw my recipe for Zucchini Fries + Zesty Ranch, you know my love for Thrive Algae Oil runs deep. Not only do I love that Thrive Algae Oil is the best oil for your heart, but I love how lightly it fries food and its neutral taste. Can we all agree that we’re pretty damn stoked that healthy fats are back? I mean, truly, the era of low-fat everything was such a low point for us food-eaters. (That’s all of us, in case you’re wondering.) So just to break it down a bit, algae oil contains heart-healthy fats. In fact, it has the highest percentage of monounsaturated fats (MUFAs) compared to other oils. Just to compare, most olive oils have approximately 75% MUFAs where as Thrive Algae Oil comes in at 90%. Done and done. And like I said, Thrive Algae Oil is so light to fry in. I’ve always loved the crispy texture of fried food but it can often feel heavy and leave me with a small case of food coma. But not in this case! It’s very light and doesn’t feel like it’s soaked into your food. Just enough to crisp up the edges. As well, the taste is so light. It’s so light you can make your 30-Second Mayonnaise with it and it’s delicious. Some have even asked if it could be the new coconut oil. I highly recommend everyone give Thrive Algae Oil a try as I know you will not be disappointed. You can even find it on Amazon, helloooo Prime. Just think, you could be making this in your kitchen by Wednesday. And thank you Jeff Bezos. And you won’t be disappointed in this recipe either. You’re a winner all around today my friends! Chicken Piccata + Braised Rainbow Chard from the Whole Smiths. 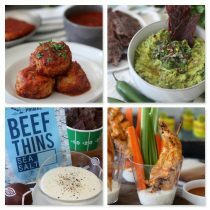 And easy to make one-pan meal that's paleo friendly, Whole30 compliant, gluten-free and most importantly crazy delicious! 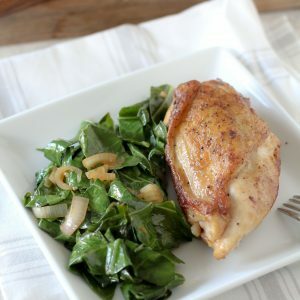 Lay chicken thighs out on a cutting board and cover with parchment paper. Using a mallet, carefully pound chicken thighs out until they are even and about 1/2 inch thick. Generously sprinkle salt and pepper over both sides of thighs. Heat two tablespoons of Thrive Culinary Algae Oil in a large cast iron skillet on medium-high heat. 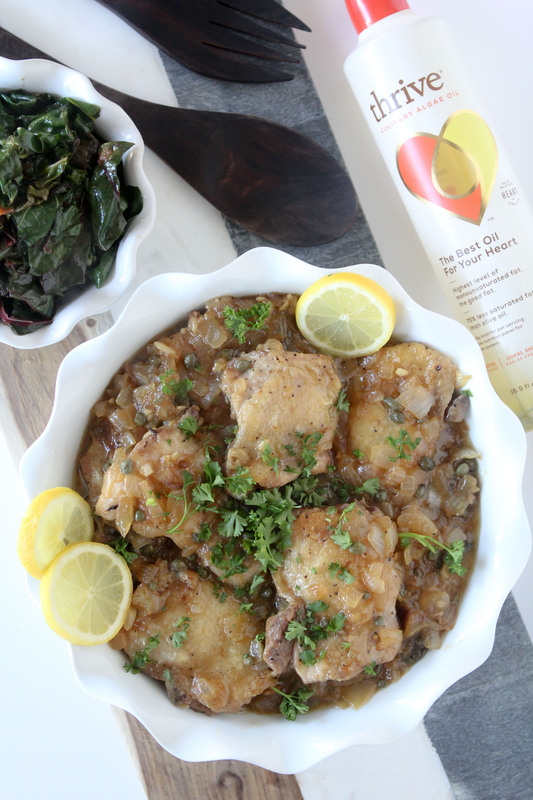 Once oil is hot, add chicken thighs into pan. Cook each side for roughly 4 minutes, remove from pan and set aside. Add chopped onions to the pan and sauté until lightly browned and tender, approximately seven minutes. Once onions are browned, add minced garlic to the pan and stir. Salt to taste. Cook for an additional two minutes. Add chicken broth and lemon juice to the skillet to deglaze, gently scraping bits off the pan. In a small bowl, add gluten-free flour and water and stir to combine thoroughly. While staring the onion mix slowly pour in the gluten-free flour roux and combine well. Once onion mixture is heated through, add capers and butter (optional) to pan and stir. Add chicken thighs back into the pan nestling them in together. Continue to cook for an additional 3 to 5 minutes. Once cooked through, add chicken dies to a serving platter and pour onion mixture over top. Add 1/2 Tbsp. of Thrive Culinary Algae Oil and apple cider vinegar to pan. Add chopped rainbow chard and toss to coat. Continue to cook until chart has slightly wilted. Salt and pepper to taste. 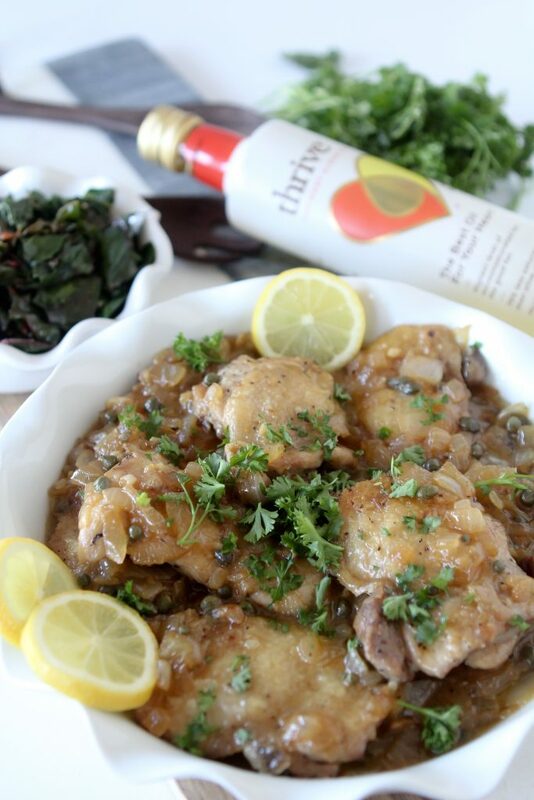 Serve rainbow chard along side of chicken piccata.